California’s role as a global climate leader will take center stage during the international climate conference hosted by Governor Jerry Brown in San Francisco this week. The world also needs to know that California is our nation’s housing crisis, homelessness, and poverty leader. We have highest percentage and highest number of homeless and poor people of any state in our nation: 9 million Californians, including 2 million children, are poor. Notwithstanding our “progressive liberal” reputation, our housing, homelessness, and poverty crisis are not color blind – the victims, once again, are disproportionately Latinos and African Americans. We have each been civil rights advocates and leaders for over 50 years. Decades of progress in minority homeownership, and housing-induced poverty, have been wiped out in California. And today’s new darling of the liberal elite, like urban redevelopment and racist New Deal programs elevating only white Americans into the middle class, is California’s climate program. We believe the world’s climate leaders also need to know that California’s climate elites have implemented stunningly regressive measures that worsen global warming while also worsening the housing, poverty, and homeless crisis in our minority communities. We are not climate leaders. Our environmental elites brag about reaching greenhouse gas (GHG) reduction targets early, even as Governor Brown acknowledges this as “hype,” and even as the Obama administration concluded that California was responsible for just 5% of the GHG reductions in the United States between 2007-2015. Our climate leaders only rely on GHG metrics that favor the wealthy and punish the working poor. For example, we count as GHG “reductions” our substantial out-migration of California’s working class families (and jobs) to states like Texas and Arizona that automatically double (or more) per capita global GHG emissions. Earlier this year, the non-partisan Little Hoover Commission reported that 33% of California is forested, but our catastrophic forest mismanagement coupled with the most recent of our unremarkable multi-year drought resulted fire storms that ultimately caused the nation’s highest death and property damage fire toll. Our climate leaders also omit GHG emissions from wildfires, although even one wildfire emits more GHG than a full year of regressive costs imposed on Californians by our climate elite. More magic GHG math applies to even simplest and normally locally sourced, low cost building materials – like wood and cement – that we desperately need to build the 3 million homes needed to solve our housing crisis. Closing a local cement plant means a GHG reduction for California, but producing and transporting cement from other states and countries with lower environmental, worker protection, and civil rights standards has zero GHG emissions under California’s climate programs. Imported wood products are also GHG-free, while sustainably using local forest resources into identical products creates (bad) GHG. The products consumed by our wealthiest are also given a GHG pass: our regulators entirely exclude GHG emissions from consumer products, luxury imports, and plane trips – to name just a few examples. Meanwhile, California’s climate leaders relentlessly pursue policies to depopulate the working class, eliminate high wage jobs accessible to those without college degrees (and debt), and further exacerbate our housing and poverty crises. Our leaders relentlessly invent new housing costs and obstacles to pile onto the minorities, millennials and students most harmed by the housing crisis, most recently by expanding a notoriously anti-housing NIMBY litigation tool called the California Environmental Quality Act, by imposing high cost types like high rise buildings to avoid “sprawl” beyond the 5% of California’s existing urban boundaries, and by requiring subsidized solar rooftops on single family homes that are entirely unaffordable to the hard working Californians who teach our schools, nurse our sick, fight our fires and deliver fancy imported electronics to our doorsteps. More insidiously, our leaders have hidden – intentionally – the cost of these climate mandates on existing Californians. We make those without solar panels subsidize those wealthy enough to afford new housing, and continuously raise housing costs even though we already pay 250% times more for a house than average Americans. We charge consumers for the “negawatts” of surplus afternoon electricity that we pay other states to take, while charging working class families in our poorest regions like the Central Valley more than $500 per month in electricity costs – we pay by far highest electricity cost of any state in the Lower 48. None of our climate elites have even bothered to acknowledge how much more we’ll pay under this year’s headline-grabbing 100% “renewable” energy mandate – but other experts confirm it will cost us more (a lot more). We impose these ever-escalating housing and electricity costs on the same inland California communities that house the millions of workers who cannot afford to live near tony Bay Area and coastal jobs centers, and are forced to “drive until they qualify” for housing they can afford, in gridlocked commutes of three or more hours each day. Yet our climate leaders have elected to cause even more poverty and pain in these communities, with unheralded increases in gasoline prices that the non-partisan Legislative Analysist’s office have concluded could cause price increases of up to 73 cents per gallon of gasoline – and beyond this new gas tax lie even more transportation costs like fees for driving each mile (even in an electric car). Finally our leaders have brought us the “road diet” of intentionally increasing traffic congestion to “induce” higher transit ridership and biking, even as rapid advances in transportation modes empty $2 million fixed bus routes amidst an explosion in demand-based shared rides and electric scooters. Climate conference delegates tiptoeing around San Francisco’s homeless while dodging needles and feces should also be on the lookout for tinted windows on serviceable sedans, where exhausted workers sleepover midweek in furtively parked cars in the neighborhoods where safety and arrest risks are carefully calibrated. Undeterred by our urban horrors, or the personal and family health, educational, and economic harms our housing crisis cause each day to workers and their families, our climate leaders propose double-down with tactics to destroy our communities. The only study done to quantify the GHG reduction impacts of ending “sprawl” by building 3 million new homes we need entirely within existing communities – by UC Berkeley scholars – concludes that this policy will achieve less than 1% of California’s ambitious new GHG reduction goals, but will require “the demolition of tens if not hundreds of thousands” of existing homes. Unleashing a new wave of gentrification and displacement in the name of climate policy, while ignoring all math – California’s entire economy produces less than 1% of global GHG, and this climate housing policy will decrease less than 1% of California’s GHG emissions. Reducing global GHG by less than 1% of 1% , at a cost of destroying existing communities to build 3 million costly new high density rental homes that permanently exclude working class families from the health and economic stability of owning a home, is environmental racism. None of this is a surprise: California’s climate leaders have a long history of putting their idealized version of the planet ahead of the health of our people. We each lived through the Cold War, where behind the “Iron Curtain” Soviet bureaucrats made ever more grandiose claims about the economic productivity of communism while ordinary people remained poor – and those who objected were shunned, imprisoned or killed. California’s environmental elite have erected the Green Curtain, where to question the policies and discrimination caused by our environmental elites is a Trumpian heresy. Totalitarian tactics that discriminate against California minorities are racist civil rights violations even when inflicted by the environmental elites of the “progressive” left. Behind the Green Curtain, we have turned to the courts to force California’s climate leaders to respect our civil rights, to disclose the economic and environmental impacts of their climate policies on our communities, and to prioritize GHG reduction measures that actually reduce global GHG instead worsening our poverty, homelessness, and housing crises. At San Francisco’s climate summit, we ask world leaders to hold California’s climate leaders politically accountable for their overheated “hype” and their civil rights wrongs. 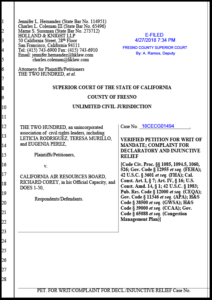 Under the auspices of CCB’s The Two Hundred Project, we filed a lawsuit after failing to convince the California Air resources Board (CARB) to modify its new scoping plan so it does not unfairly and disproportionately affect families of color. The Two Hundred filed a civil rights discrimination lawsuit on April 27, 2018. Enclosed is a background description and explanation of why we had to take this action. Also, on July 23, 2018 a settlement hearing was held to see if we could reach a compromise to avoid the suit. Their attorneys warned me that I could not disclose details of this meeting however you can guess by the tone of this communication how well that went. They will get back to us in three weeks and perhaps I will be free to share the results with you. The Two Hundred (The 200) has filed a civil rights violation lawsuit against the California Air Resources Board (CARB) to stop implementation of their scoping plan. A plan that is very detrimental to the health and economic welfare of California’s communities of color. CARB is supposed to be the clean air agency protecting Californians from unhealthy and polluted air. It has 1500 employees to do this with 15 board members. CARB’s scoping plan has four measures that expand the California Environmental Quality Act (CEQA) and make it even more expensive to build homes. As we know, CEQA has been for a long time, misused by wealthier white homeowners (NIMBYS) to keep minorities out of their neighborhoods they do this by filing numerous anonymous CEQA lawsuits on workforce and affordable housing developments that eventually discourage builders or stops projects. ● A numeric per capita threshold or a per person polluting quota. (Can you believe this?). Cities and counties are supposed to come up with ways to enforce this. ● A mandated “vehicle mile travelled” mileage quota for each person with a per mile charge. This charge will hit communities of color hardest because they commute farther to work from lower cost of living regions. ● And a “vibrant communities appendix” which quite frankly we have tried but failed to totally understand. It directs eight, (yes eight) state agencies to act as big brothers and block the few housing projects already approved by local governments. They can also block voter approved new infrastructure transportation projects. The stated purpose of this “scoping plan” is to address climate change by decreasing greenhouse gases (GHG). A good cause but not a critical one because California only contributes 1% GHG worldwide and this scoping plan will only decrease this amount by 1% (yes, 1% of 1%). Last year California’s grass and forest fires created nearly five times more air pollution than the goal they are trying to achieve. The unintended consequence of this scoping plan increases the already astronomical cost of housing and cost of living in California. These costs disproportionately attacks low and moderate income families and endangers the economic future of the state. The high cost of housing affects the communities we are most counting on to keep California afloat and to fund the senior entitlement programs our elderly are planning on. California has the highest housing and living costs in the nation – 2 million Californian children live below the national poverty line. Our housing shortage and housing prices are a primary source of our huge and growing homeless. The primary cause of this catastrophe is the shortage of 3 million homes to meet the need. The scoping plan raises the cost of housing by making it easier to file CEQA lawsuits that reduce overall supply at a time we need it most. Families of color are disproportionately affected. Thanks to decades of redlining, predatory lending and the recent mortgage meltdown African American wealth is 16 times less than that of white families (Forbes). In spite of this, CARB’s scoping plan would add additional cost to home building to meet the net zero goal. And in doing so would push working families farther away from work to find low cost housing and then charge them a per mile fee for driving more. The scoping plan also contributes to gentrification by encouraging destruction of workforce housing to build expensive apartment towers current residents will not be able to afford. The Two Hundred (The 200) believes in preserving the environment for our children too – but our families shouldn’t have to shoulder most of the effort and cost. Millennials, Minorities, and Students (M&Ms) will be the first generation to be less well off than their parents. How will they afford homes, families and student debt and still pay California seniors’ entitlement programs they have become accustomed to? California needs to develop legislation similar to CEQA that measures the actual impact of protecting the environment policies on people and livelihoods, perhaps, a California People’s Quality Act (CPQA). In this way, laws such as CEQA could be forced to distribute the cost and benefits of environmental protection more fairly. This is particularly important for communities of color which are often disproportionately negatively impacted by public policy. We should pay our share to clean the environment but only our fair share. CEQA is a law created to protect the environment. It grants developers permission to build prior to breaking ground. Why is The Two Hundred against CEQA? We are not against CEQA, but we would like to improve its effectiveness and eliminate the way it encourages litigation abuse. Litigation Abuse is the misuse of CEQA to protect special interest groups like NIMBY (Not In My Back Yard) organizations or Building Trades Unions. NIMBYs use CEQA to stop construction of projects out of fear of the depreciation of their homes or socioeconomic change in their communities. Building Trades Unions use CEQA to extort prevailing wage contracts and are some of the biggest abusers of these laws. How does CEQA litigation abuse harm Californians? Litigation abuse raises the price of housing due to the costs of the delays. Developers often abandon projects because NIMBYs will keep them in court for as long as possible. A 2015 study estimated that land use restrictions costs the United States upwards of $1.5 trillion in lost productivity. CEQA abuse also undermines the state’s environmental, climate, social equity and economic priorities by making it impossible to complete affordable housing projects, new forms of transit and even community parks. It harms the poor, working class and the young, and obstructs environmental priorities. Is The Two Hundred Opposed to environmental protections? The Two Hundred is not anti-environment or opposed to CEQA. In fact the environment is one of our top priorities. Many low-income minorities live in some of the most polluted areas. We need CEQA the most because the communities we represent are in greatest need of their protection. However, we are opposed to how NIMBYs use CEQA to camouflage their interests behind environmental concerns. CEQA has great intentions but the unintended consequences have hurt low-income communities of color. We want to make CEQA stronger by getting rid of those parts that people misuse when they engage in CEQA litigation abuse. What are the immediate benefits to ending CEQA litigation abuse? Ending litigation abuse will result in the timely construction of more housing developments at a lesser cost, the creation of more jobs to build these projects, and proof to skeptical taxpayers that California can complete important public projects on time. 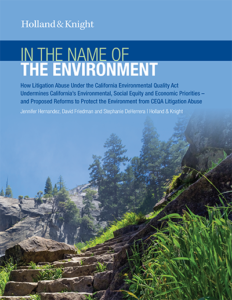 How can we end CEQA Litigation Abuse? Require those filling CEQA lawsuits to disclose their identity. The legislature can and should require full transparency for any litigation under CEQA. Interest groups should not be able to hide behind CEQA anonymity. Some projects have been sued more than 20 times. Restrict the effects of a lawsuit on a given project. The simple act of filing a CEQA lawsuit can choke off funding and stop a project even if the lawsuit has no merit and is filed for non-environmental purposes. 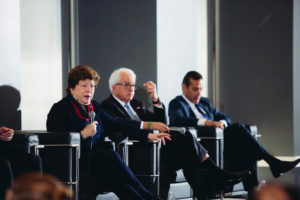 What does the future hold for The Two Hundred’s Relationship with CEQA? Without the abuse of this important law, The Two Hundred maintains that CEQA is vital to the future of our state. Our goal is to work with the environmental community to improve CEQA by removing those elements that allow NIMBYs and unions to misuse it, while keeping those that continue to protect the environment. In the future The Two Hundred expects to work side by side with CEQA to fulfill our goals of protecting the environment and providing affordable housing for low income California residents.